kochi - Will Kochi be a book? Will Kochi be a book? What was the thinking behind drawing Kochi in pencil? It was an idea that came about when I started it six years ago, I’d been drawing comics solely in black ink, thick lines, all confined in panels. I wanted to try playing around and doing something different, to do a comic which wasn’t constricted by panels, rather the action spilled out all over the page. Doing it in pencils, I felt, would show a side to my drawing that people hadn’t otherwise seen, since I’d always loved using pencils but never really employed it in my comics before. Around that time I’d also been reading comics like Herobear and Serenity Rose, which had such great fluid textures to them, and I was keen to add my own contribution. They showed me you could make coherent, beautiful things while trying something outside of your comfort zone. Drawing in pencils takes a lot longer to do, but the end result it far more organic than ink I think. Is the story for Kochi autobiographical in any way? It kind of is, but in ways I can’t really talk about until the book has finished, for fear it’d ruin the ending (and consequently, what the whole book is about). There are themes in Kochi I wanted to explore, these, and my reasons for doing so, will hopefully become clear at the end. As for the characters, I’d identify most with Kochi of course, but none of the events here ever happened to me. The setting for this whole comic is a place I used to live called Edenbridge, which was a cute little village. I went back there to take a whole load of photos when I started this comic, I wanted to capture something about it. Particularly the field the friends are sitting in when they’re avoiding the Bee Festival, that’s the cricket field across from my old house, which used to get the most beautiful displays of evening sun coming through the trees. So every scene I drew for Kochi, although I don’t often show the backgrounds, were very much set in specific places I knew. Is there going to be a Kochi book? Simple answer, I don’t know. Kochi was always intended to be a book, of course, but in my mind I had viewed it as a self-publishing experiment, maybe printing a very limited run of 50 hardback copies, all signed. Fill them with extra material and make them kinda special. I can’t tell you how much trouble I’ve had trying to get this sorted. I’ve been through every print-on-demand place, a number of small-run printers, with all of them making test copies and ordering samples, usually having to completely reformat the book for each specific printer’s requirements (a time-consuming task). And the end result? Every time, it prints poorly, way below my expectations. And the price I’d have to sell it at (about £30) wouldn’t justify the print quality I’m getting. So yes, I have Kochi books lying around, but they’re just not good enough. And I don’t see any better way of doing it, that is affordable. 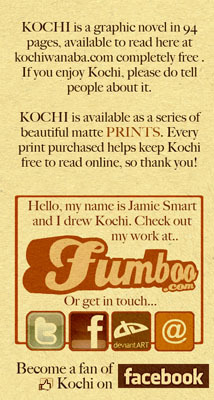 If a publisher would like to take Kochi on, and make it into a book, then by all means I’d be keen to discuss it. Seeing Kochi as it was intended, a good-quality, nicely-bound book would be wonderful, and the culmination of all this work. Any more questions, about what I’ve said here, the plot, the characters, etc etc, leave it as a comment and I’ll try to reply likewise! This may be a silly question, but how is the name Kochi pronounced?